A small village with a seemingly boring lifestyle for its inhabitants houses more dark secrets than any would care to learn. For nearly twenty years, the village of Saint-Ferdinand has been plagued by a killer. Many villagers have died and many more will follow if Inspector Stephen Crowley and his team can’t find the one behind the killings. Even after Inspector Crowley catches the killer, he learns of a much darker force that poses a far greater threat than ever imagined. This threat of hatred and death has plagued the village with evil for a long time and has now found itself trapped in the strangest of places: a backyard shed. Author J-F. Dubeau is making a name for himself in the world of writing. 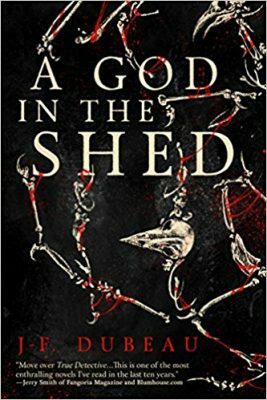 With his debut science fiction release in 2016, he has chosen 2017 to dabble in the genre of dark horror fantasy with his latest novel, A God in the Shed. It is an intriguingly short and creepily realistic story that reads like a murder mystery thriller with a fantasy twist. When opening its pages, one can expect to find death, magic, gods, necromancy, and more all occurring during the present day time period. Of course, no story would be complete without the characters to help it along and there are many to be found, ranging from an inspector to an average teenager to a murderer to a reporter to a dead little girl. Each chapter focuses on one of these particular characters and readers will be pleased to discover each character has his or her own unique personality and thoughts. Calm seeming Inspector Stephen Crowley has a temper that can flare up at any given moment. Venus McKenzie is a teenager with the freedom anyone her age longs for, but she wishes she had stricter parents and a normal name. A murderer who turns themselves in because they didn’t want to kill, but did. A reporter who wanders into town curious about the killings, but who seems to have a hidden agenda. A little girl who was one of the murder victims, but remains as a spirit, tethered to the village frightened and scared. These are but a few of the characters readers will meet and it is surprising when the murderer is revealed rather early in the story, so the question is not who the murderer is. There are actually two real questions readers will ask: Who will die next and who is the god? Normally readers know that the protagonist(s) are safe from death in stories (unless the author is George R. R. Martin); however, Dubeau followed Martin’s example, for in A God in the Shed, no one is safe… not even the main characters. As to the other question, the only character not to have its own chapters and the one readers are most intrigued by is the god. Readers get an idea of what it is through small snippets found in some of the chapters, the creature being a thing of “hate and death” and was made of “blood and shadow”. Readers will also discover somewhat how it came to be in the village in the very intriguing and dark prologue, yet it remains a large mystery to the reader as well as the citizens of the village. While it would have been nice to read from the god’s perspective for even one whole chapter, the mystery behind it makes readers curious and intrigued for future books. 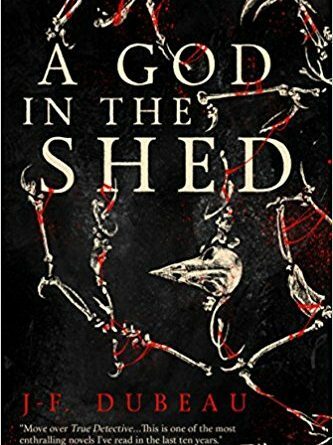 While more of a murder mystery fantasy than a horror fantasy, A God in the Shed most certainly has its share of thrills and creepy factors that will make readers anxious to know what happens next. The story does have a bit of a slow start and it can be a bit repetitive at times; however, all other aspects of the story, including the many unique characters, the mystery of who will die next and who this terrifying god is, the realistic feel of the plot, and the attention to detail, capture the readers’ attention and make them want to keep reading. Dubeau does plan to write future books to follow A God in the Shed. Perhaps more main characters will be killed in the future. Perhaps there will be more of a horror factor to follow the suspense and thrills. Perhaps readers will discover who or what the god truly is. Until then, readers who complete Dubeau’s latest novel can only hope he writes the sequel soon.